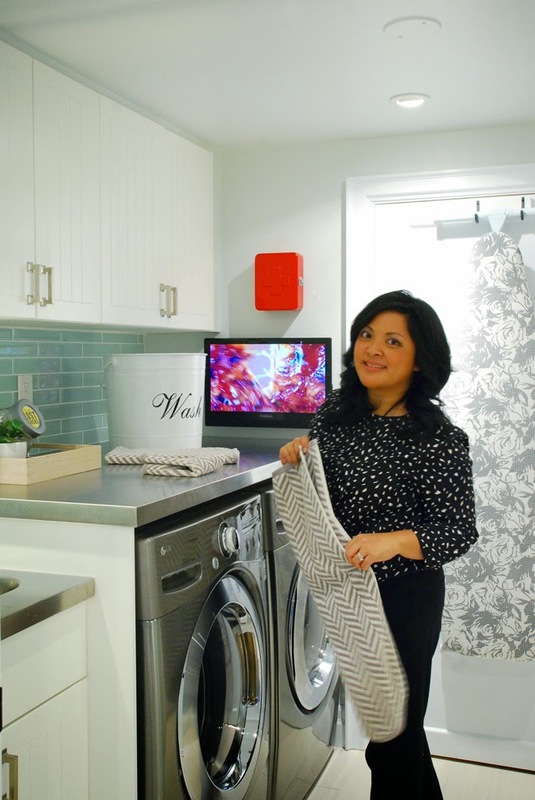 To keep this renovation within budget, we knew that we would be using Ikea cabinets in the laundry room. We purchased the cabinets during one of Ikea's kitchen sales and installed the cabinetry ourselves to save even more money. Using Ikea was a good decision not only from a cost perspective, but also from a design standpoint. With a bit of ingenuity, you can take scrap pieces from the As Is section and do things like adding fillers panels to give your cabinets more of a built-in look or raise your cabinets off the countertop. I'm happy with the mix of upper cabinets and pot drawers we used. 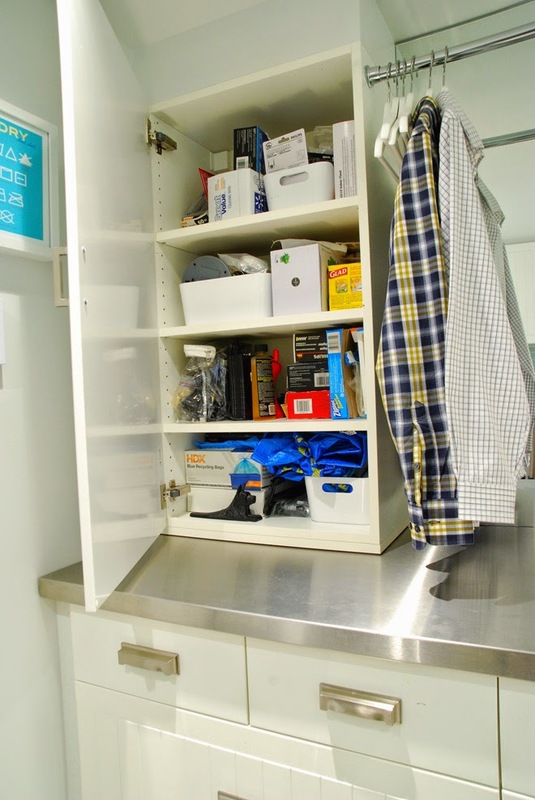 They maximize our storage in this galley layout and have held up really well. We open these doors and drawers A LOT and they don't show any signs of wear or tear. The one thing I don't like though are the open shallow sides of the pot drawers (you can see them here). The pot drawers hold items ranging from trays and decorative accents to extra linens and I find things are always spilling out and getting caught on the sides. I wish the sides were full height and contained contents better. We considered different options for the countertop and ultimately went with stainless steel. Building the substrate and doing the installation ourselves made them affordable, otherwise we would have went with laminate. 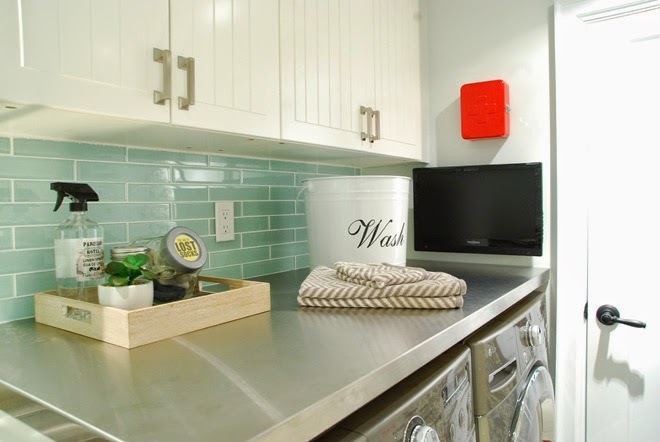 The countertops are really easy to clean and are a fantastic surface for folding. I also like the reflectiveness of the stainless steel; it makes the room feel brighter. However, the counters are showing some minor scratches - this is not the material for you if you like pristine countertops! The countertops also show fingerprints but since this room doesn't get used every day, it's not too difficult to wipe them down every once in a while. One thing we did do is drop the height of the sink cabinet. We could have kept it flush with the countertop over the machines, but as you can see above, I'm vertically challenged and even folding on top of the countertops can be a little awkward. Keeping the sink at standard height was the right thing to do, especially considering that Chloe uses this sink as well to clean up after craft projects. I'm extremely happy that we went with an extra deep sink (the Ikea numerar which unfortunately they don't sell anymore). It's handy for filling pails and cleaning paint brushes and keeps the splashing contained. We did however, make one error and failed to measure the distance of our faucet handle from the backsplash! As a result, we can't push the handle all the way back to get 'full' heat. 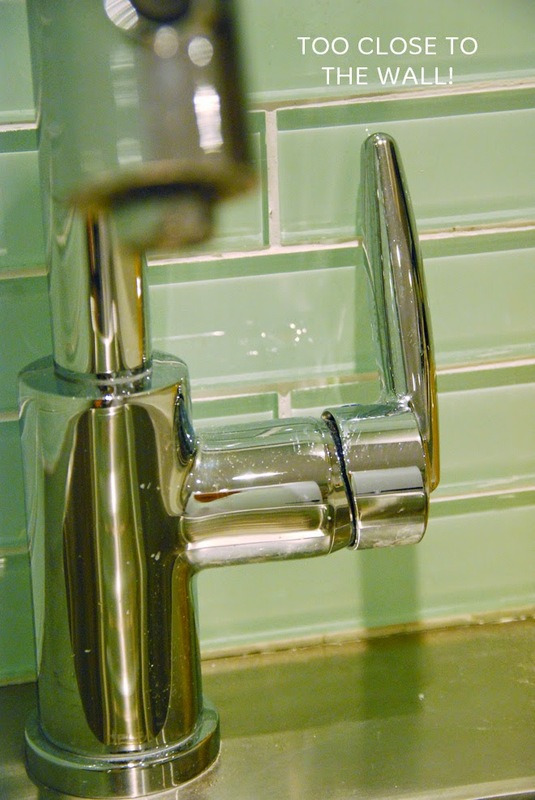 I might consider switching out the faucet for one with turning cross handles but I really really really love this faucet. It's the Delta Single Handle Grail Faucet and has a pull down head which is great for cleaning the deep sink. The backsplash is another feature I'm really happy with. The glass tiles add colour and bring interest to the mostly white space. 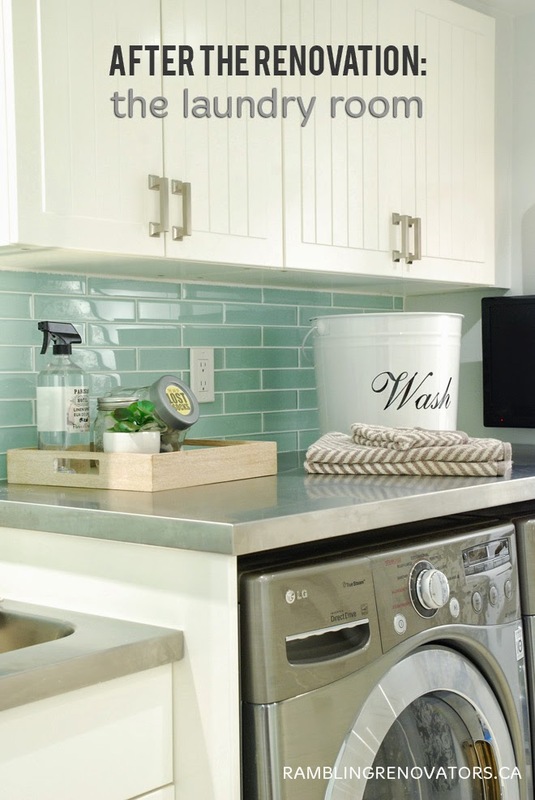 They're also easy to keep clean (unlike the marble backsplash in our kitchen!). This is small room, about 8'x10', and I thought all we would need to light it was a pot light over the sink and two more down the middle of the room. HandyMan didn't think that would be enough - and he was right! We put four pot lights in the main part of the room and one over the sink and really, we could have used two more to make the room feel nice and bright. 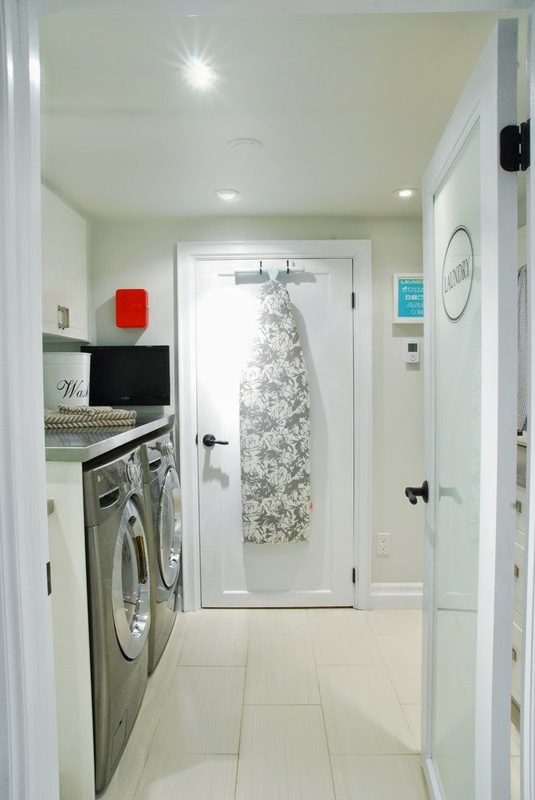 Even though the entry door is frosted and the finishes are bright and reflective, the lack of natural light makes the laundry room feel somewhat dark. When in doubt, add more light! The ceramic floor tiles are another element we fretted over. They are probably the thing I am most disappointed in. I was really fond of a bamboo-ish pattern tile and found different variations of it in many tile stores across the city. We ended up purchasing a tile, which, installed in an empty room, looked light grey. But once we put in the white cabinets and painted all the trimwork, the tiles looked definitely more cream than grey. Ugh. I'm not sure how we could have avoided that but in future, I'll be a bit more wary of light tiles. Overall, there is not much I would change about this room. 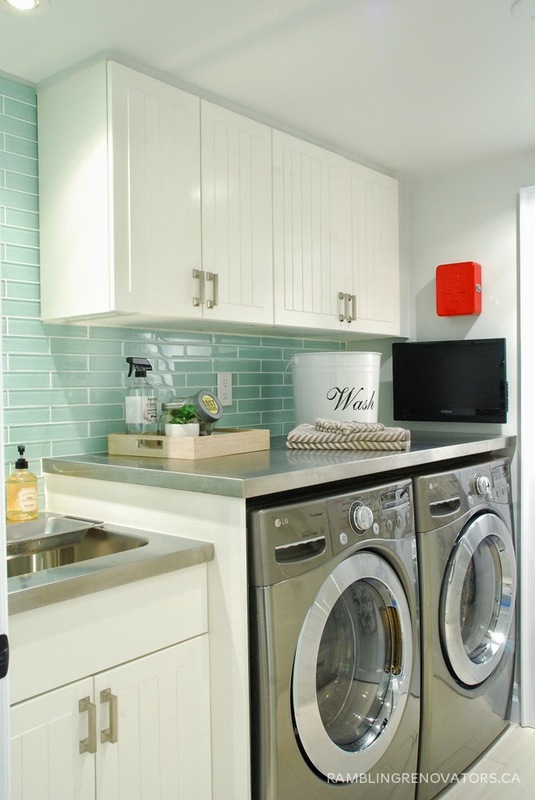 Laundry rooms are often neglected spaces but we made ours a little jewel box in the basement. 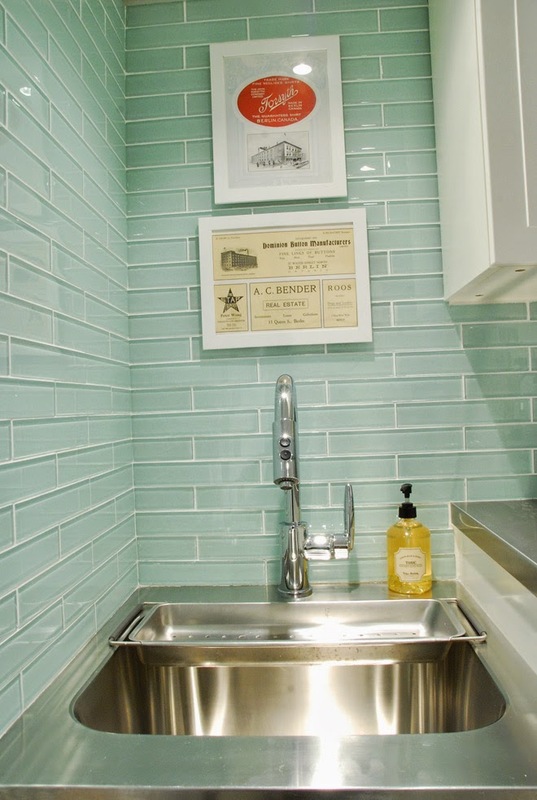 It might look luxurious for a laundry room but we did our cost comparisons, did some diys, and the materials, apart from the glass tile, weren't really a splurge. The best thing about this room is that it functions really well - supplies are just where you need them and are easy to find, there's enough storage to put things away and keep the room neat, you don't have to "think" when you're in this room. The key to making a space like this work is starting with how you want the room to function and planning the layout based on that. I would say that's true for most rooms.